SPCA Greed a world wide issue are we going to condone it? 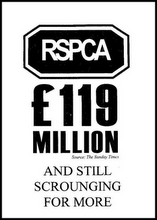 Time for a review of RSPCA Animal Charity’s Bullyboy Tactics ? What happens in New Zealand is generally something which has happened over seas. do look at this excellent site and see what is in store for us. compare the posters above with the poster by Neil Wells of AWINZ see a similar trend? But some people who’ve had animals taken away by animal rescuers say some SPCAs have acted like petty tyrants on power trips. They say they use their police powers to take away people’s animals, even when the animals don’t need rescuing….. Residents of Ontario are helpless and so angry at the continued lawlessness, arrogance, vindictiveness and ignorance exhibited by Ontario Society for the Prevention of Cruelty to Animals’ (OSPCA) inspectors and volunteer agents. Tell me, where do we go for help? The Ministry of Community Safety and Correctional Services under Minister Bartolucci empowered the OSPCA with extraordinary police powers (Bill 50) which directly violate the Canadian Charter of Rights (warrantless entry in the hands of a self-funded charity – who does that???). Millions of tax payer dollars have gone to the OSPCA provincially and federally in the form of one time grants. This in addition to the $15 million they collected in donations in 2009. None of that would be an issue except that there’s a COMPLETE AND UTTER LACK OF OVERSIGHT, ACCOUNTABILITY AND TRANSPARENCY. You admit, under current legislation your Ministry is precluded from investigating the OSPCA. How is it that possible? We can’t go to the Ombudsman for help because the OSPCA although called forth, mandated, empowered and partially funded by the government is “not a governmental agency”. Appeals of orders and/or seizures via the Animal Care Review Board are available only if requested during the first 5 days. After that – nothing. Truthfully, the only vehicle available to farmers and animal owners with a grievance against the OSPCA are the courts which, realistically speaking, are not an option for the common man or woman. We are at the mercy of your Ministry’s legislation and we are begging for your help. We have been begging for help for years. The law must be changed. The OSPCA has done as it pleases for far too long. Issues of improper governance, spending, euthanasia rates & shelter protocol, abuse of enforcement powers, perjury, lack of transparency, charter violations, conflict of interest, allegations of extortion etc. must be swiftly addressed. We’ve already had one farmer attempt suicide as a direct result of repeated bullying tactics of OSPCA inspectors. SOMEONE, SOMEHOW, SOMEWHERE must be able to hold this private self-funded police force accountable for their actions. Please amend the OSPCA act to ensure accountability, transparency and governmental oversight of the Ontario Society for the Prevention of Cruelty to Animals. Recently well over 2,000 petitions have been distributed to virtually every MPP in the provincial legislature. We demand that your Ministry review the powers of the OSPCA. Re-read the province wide Bill 50 Committee hearings in Hansard July 2008. Do not ignore this issue. Too many families live in utter fear of the Ontario SPCA. I do not believe this is what the government’s intent was in passing the Ontario SPCA Act. 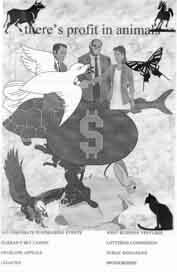 Comments Off on SPCA Greed a world wide issue are we going to condone it?